Thousands of Mexican students STRIKE! Some of the striking students in Mexico City. Photo: Infoaut Informazione Di Parte. —Woman student in an assembly on Aug. 291https://www.facebook.com/JuventudAnticapitalistaCCHSur/videos/326588724569931/. —Male student4Interviews by the author. —Female student5Interviews by the author. That Sept. 3 demonstration was attacked again by porros, leaving at least six students injured, two of them in a critical condition. The attack occurred inside the UNAM central campus. Again, campus security personnel didn’t do anything about it. Immediately, dozens of faculty members from UNAM and other universities went on 48- and 72-hour strikes. 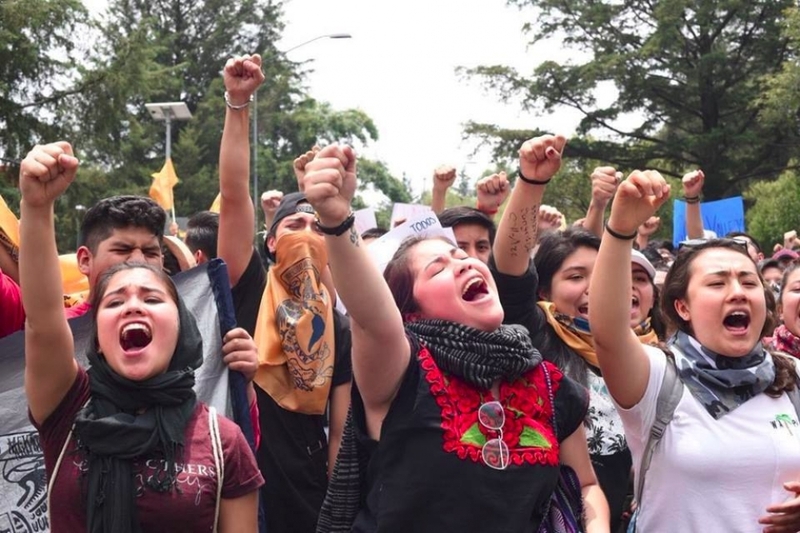 On Sept. 5, a march with tens of thousands of students and other social groups flooded the UNAM campus to demand an end to porrismo, which has been a long-time practice used by the authorities to stop students’ movements. 1, 2, 3, 6, 7. ↑ https://www.facebook.com/JuventudAnticapitalistaCCHSur/videos/326588724569931/. 4, 5. ↑ Interviews by the author. This entry was posted in Articles and tagged femicide, high school students, J.G.F. Héctor, Mexico, National Autonomous University of Mexico (UNAM), students, students' movement, violence against students, youth. Bookmark the permalink.